The Passover story has been retold many ways throughout the centuries, but we continue to be amazed at the creative ways used to enable each generation to discover the details of the story that we read in the Haggadah each year, and to bring home the meaning of the events in new ways. 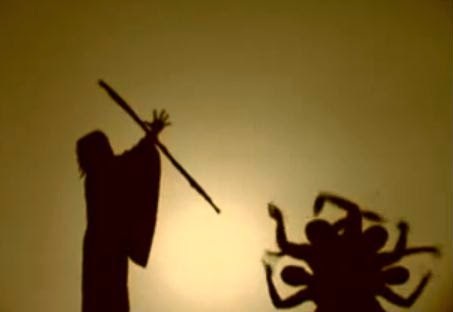 A few years ago, a Hungarian dance troupe called the Attraction Black Light Theatre, put together a shadow dance performance in which they re-envisioned the events from the birth of Moses to the receiving of the Ten Commandments. The video below is of a performance in Cancun, Mexico, in 2011. Using a sheet, their bodies, and lights, the 12 member dance troupe illustrates the toils of the enslaved Jews, Moses' encounter with the burning bush, the ten plagues in Egypt, Moses receiving the 10 commandments, and the eventual freedom of the children of Israel. Among the objects they depicted in shadow by repositioning their bodies, we spotted pyramids, a palm tree, Pharaoh, the Burning Bush, the Ten Plagues, a bird's nest, a camel, a chariot, the splitting of the Red Sea, the Ten Commandments, the Ark of the Covenant, a Star of David, and a wine goblet. Using dance and shadow, the troupe gives us a memorable way of reliving the Passover story as a reminder of the enduring value of history, homecoming, and freedom.